Over 30 years of experience in designing, machining, fabricating, and building automated equipment for industry is the basis for the products you see here. Everything from specialized tooling to robotics has layed the foundation for the products being manufactured now. After managing a large machine shop with many employees, the jump to self employment happened in 1996, forming White House Machine, LLC. In 2002 Full Pull Motorsports was created. After a severe motorcycle wreck left me unable to walk, the assets of that company were restructured, and moved to its current location. After about 9 months of rehabilitation, someone called and asked me to build them a tractor. I told them it might take a while, but would like to try again. 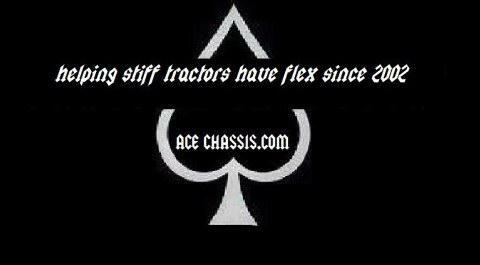 In 2004, Ace Chassis was formed. After that was done, another, and then two more, and... well, hopefully they will keep coming. Each tractor has its own story, and I am proud to be involved in the process of making these machines go. Many hours are spent making improvements and tweaking designs, and each custom tractor is made to order.